Precarity is a live performance of the artist balancing the Diagnostic and Statistical Manual of Mental Disorders (DSM) on their head. The gesture is reminiscent of finishing school exercises aimed at improving the posture of young women. Initially deployed in the Victorian era, these tropes were resurrected in the mid-20th century amidst post-war anxiety about gender roles. Women, having flooded into the workforce necessarily during World War II, were under pressure at war’s end to return home. Popular culture, aided by advancements in technology, championed women’s return to the domestic. It was common to see images of women balancing books on their heads in movies, on television, and in literature and advertising. Around the same time, the American Psychiatric Association formed a task force to produce a standardized psychiatric classification system resulting in the publication of the first Diagnostic and Statistical Manual of Mental Disorders in 1952. For more than 20 years, Homosexuality was listed as a mental disorder in the DSM until the early 70’s when it was removed and replaced by gender identity disorders related to non-conforming behaviors. Currently, Gender Dysphoria is the required diagnosis one must achieve in order to have access to hormonal and surgical interventions on the body. This places the trans and gender non-conforming body always in relation to medicalization and pathology. 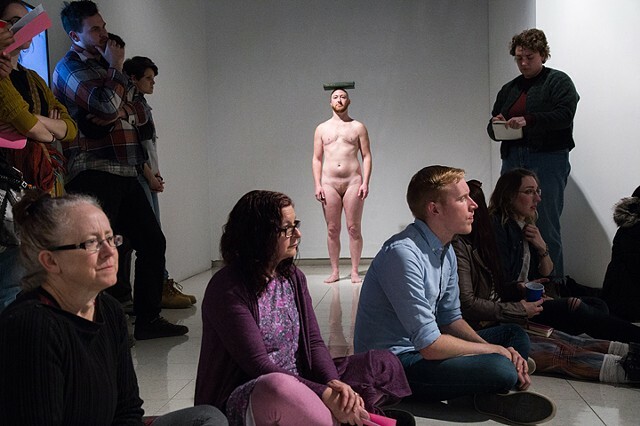 This durational performance demonstrates the perpetual, delicate balance trans and gender non-conforming people maintain between identity and diagnosis.